After a long ascent, last year Domino’s in Ann Arbor Township became the largest pizza company in the world. Now all eyes are on the CEO transition from Patrick Doyle to Richard Allison. 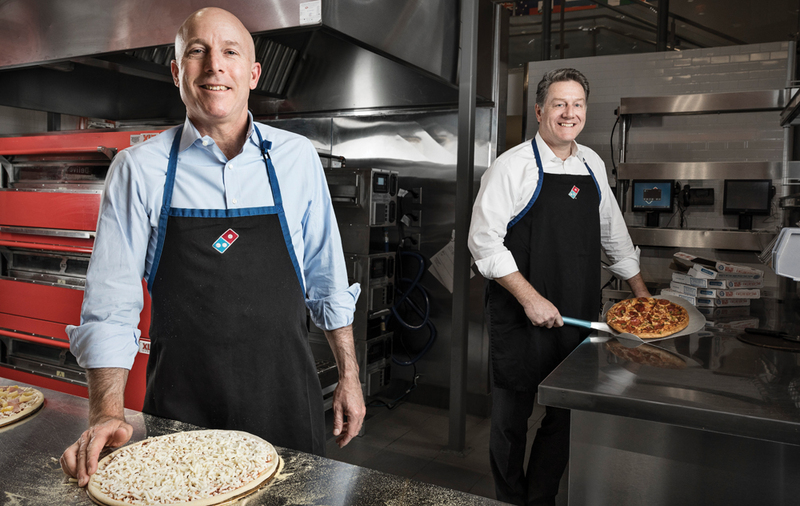 At the end of June, Patrick Doyle, right, president and CEO of Domino’s Pizza Inc. in Ann Arbor Township, plans to turn over leadership in the company to Richard “Ritch” Allison, left. Since the announcement was made in January, Doyle and Allison have been almost inseparable as they plan for a smooth transition. For his part, Allison says he will continue to aggressively invest in new technology, work closely with franchisees, and look for new opportunities for growth. Nothing lasts forever, especially in the fast-paced world of corporate America. John Schnatter recently wrote a book about his life and his company called Papa: The Story of Papa John’s Pizza. The founder and chairman of America’s No. 3 pizza chain tells how he built “an international restaurant powerhouse” beginning in a broom closet in the back of his father’s bar in Jeffersonville, Ind., and went on to star in the brand’s commercials. Then, Schnatter abruptly stepped down as Papa John’s CEO late last year, after controversy over his criticism of the NFL’s handling of anthem protests. That left room for Patrick Doyle, president and CEO of Domino’s Pizza Inc. in Ann Arbor Township, to emerge as the better pizza performer; sometime last year, Domino’s finally muscled past Pizza Hut to become the world’s No. 1 pizza seller. Instead of taking victory laps after eight years as one of the most successful CEOs in the restaurant business, Doyle would rather pile up victories, share the credit with everyone else at Domino’s, and move on to the next race. 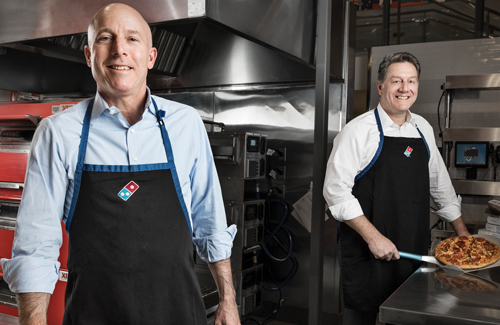 In an announcement that’s about as close as the C-suite gets to a mic drop, in January Doyle announced that he’s resigning from the company at the end of June and turning over the reins to Richard “Ritch” Allison, Domino’s president of international operations. Doyle says he’s met his main goals. In fact, Doyle says he started talking about succession “a year after I started the job. That’s a persistent and ongoing conversation” with Domino’s board members. 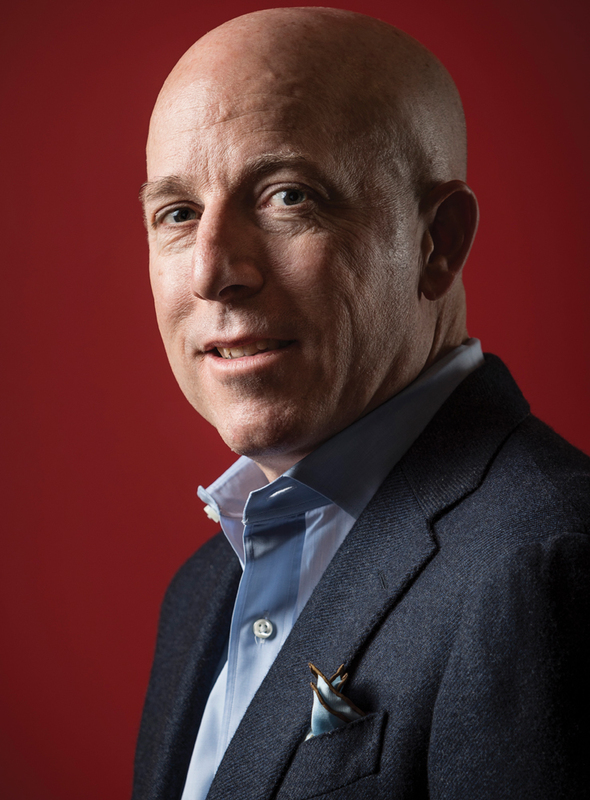 While promoting Allison to president, Domino’s also elevated Russell Weiner, currently president of Domino’s USA, to the newly created role of COO of Domino’s and president of the Americas. What a legacy the 54-year-old Doyle is leaving. While much of the rest of the fast-food industry struggles, Domino’s has been reporting consecutive quarterly same-store sales gains at its U.S. outlets for seven years. And these aren’t small revenue increases that only match the inflation rate — the typical quarterly gains at Domino’s stores open more than a year averaged between 8 percent and 10 percent over the previous year. Domino’s overseas franchisees also have been racking up impressive sales gains. In the process, Domino’s finally caught up with Pizza Hut last year and now, according to reliable industry metrics, it has nosed out the long-term leader as each clutches about a 15-percent share of the overall U.S. pie. Investors have recognized Doyle’s accomplishment: Domino’s shares have soared from about $3 in late 2008, in the depths of the global financial crisis, to up to $212 per share in January, threatening its record high of around $218 in June 2017. While the price dipped for a couple of days after Doyle’s retirement announcement, Domino’s stock quickly rallied past previous highs as investors realized Domino’s was in great shape and has plenty of room for growth. As president of Domino’s International for six years, Allison cut his teeth at the company in the same bailiwick that Doyle did. Allison oversaw growth in Domino’s sales abroad by doubling the size of its global footprint to more than 9,000 stores in more than 85 markets. And while Pizza Hut still leads Domino’s in China by a long shot, Allison helped make Domino’s the leader in India, where demographics are equally promising. Notice that Allison didn’t specify the company’s food as a major target for new investment. In the fast-food business, limited-time products such as Taco Bell’s Doritos Locos Tacos or pizza crusts stuffed with slices of hotdogs often qualify as market-movers, and new category-changers, like McDonald’s line of specialty coffees, can extend success for years. But Domino’s hasn’t ascended to the top of the pizza business just on the strength of a radical — and very public — transformation of its menu. The food is fine, but these days it’s not the story. Domino’s has a roughly 15 percent share of the pizza market in America. “But we’re only selling one out of seven pizzas in the United States, so there’s so much room for us to grow,” says Doyle, above. Instead, Doyle has led Domino’s to the pinnacle by turning it into the easiest place in the universe to order and receive a pizza. Having learned the importance of service from Domino’s iconic 30-minute delivery guarantee, Doyle has poured immense resources into establishing an online ordering and delivery platform that has become the lifeblood of the business. Customers can order and track their Domino’s pizza via text message, their Apple watch, a “zero click” system, emojis, the Sync program in a Ford vehicle, and a Facebook Messenger bot. As a result, Domino’s online ordering platform has risen to about 60 percent of its annual business from less than half that five years ago. Besides bolstering the top line, the digital sector also pads the bottom line, given online ordering requires less labor, there are many fewer mistakes, and online customers tend to order more than customers using a phone do. Domino’s has left both Pizza Hut and Papa John’s eating its digital dust at a time when such capabilities are playing a huge role in determining winners and losers in the business. “Other chains won’t be able to succeed in the same way just by mirroring Domino’s activities,” says Erik Thoresen, principal at Technomic, a food service consulting firm in Chicago. Domino’s digital predominance is the result of a decision that Doyle and his predecessor, David Brandon, made coming out of the recession. At the time, in 2009, Doyle was president of Domino’s U.S. business as well as heir apparent to the top job. The pair decided that Domino’s would somehow have to leverage technology to spark growth. “We didn’t know what it would look like yet, but we had to be in the center of (technology), understanding what was going on and creating a competitive advantage by being ahead of the curve,” Doyle recalls. Despite their success so far, there’s plenty for Domino’s digital legions to do. 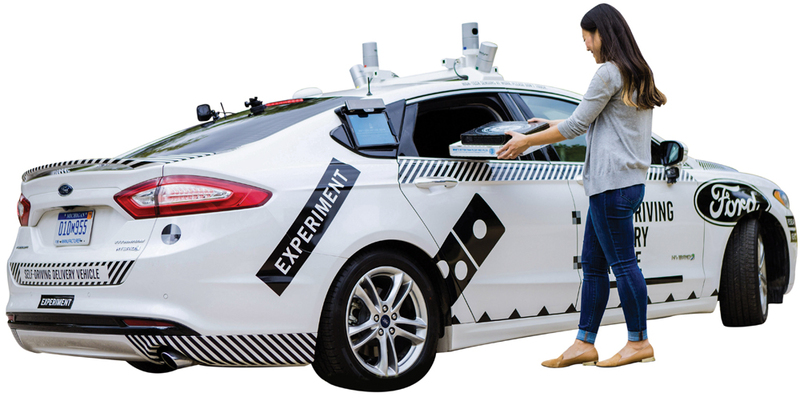 They’re still evaluating the results of a test involving a self-driven pizza-delivery vehicle that Domino’s recently conducted with Ford (see sidebar), and they’re figuring out how to deploy “opportunities in digital payments to make them more secure and seamless,” Doyle says.While young, tech-skilled workers tend to favor urban settings, Domino’s campus has its own appeal with a Frank Lloyd Wright-style office complex that hugs the intersection of U.S.-23 and M-14 just northeast of Ann Arbor. More than 400 people who could be described as “techies” create the pizza company’s cutting-edge digital technology. Other goals for the company’s tech division include anticipating innovations that haven’t even been conceived yet, by people who haven’t even been hired yet, and by companies that Domino’s doesn’t yet consider competitors. 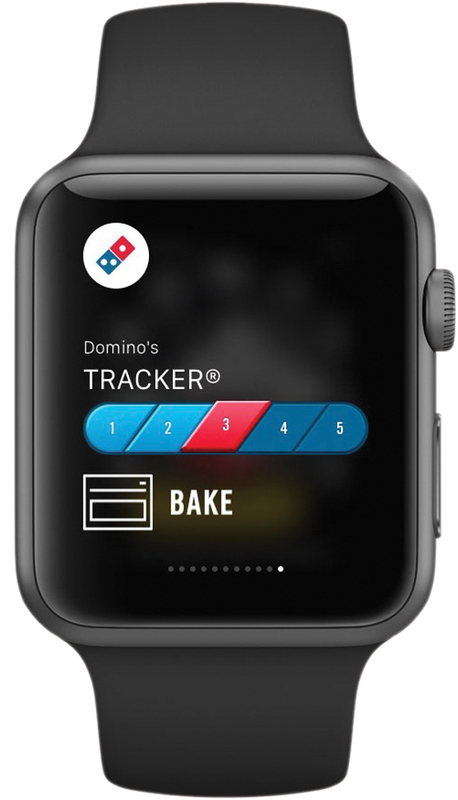 To drive online sales, Domino’s has debuted numerous digital ordering offerings for the iPhone, Apple Watch, and other devices. All of which reflects the fact that Doyle is very competitive. In fact, he wants Domino’s to become a dominant force in the pizza business — a company that commands at least 25 percent to 30 percent of a market that remains the most fragmented in the quick-serve-restaurant industry. “He loves to win,” says Timothy McIntyre, Domino’s executive vice president of communications, investor relations, and legislative affairs, and a Doyle confidant. “When he took the CEO job in 2010 and stood on a stage in front of our franchisees from all over the world, in sort of his inaugural address, he said he wanted Domino’s to be the No. 1 pizza brand in the world by the end of the decade.” Doyle was able to check off that box even as he pondered exiting the company. 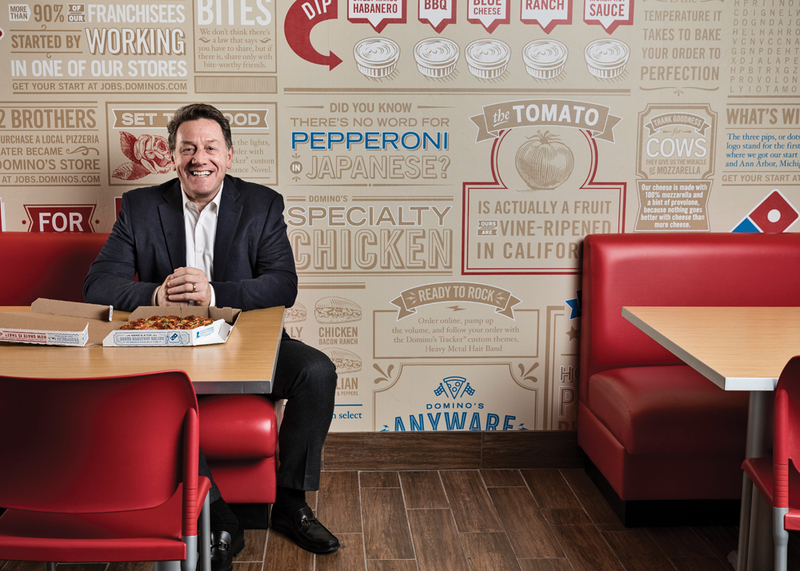 Still, Doyle isn’t as recognized, as one might expect, for being the architect of remarkable growth and the leader who has made Domino’s ascendant. Not even national magazine profiles of the company typically have celebrated the role Doyle has played. Maybe that’s because he’s so normal. In fact, some people affectionately describe him as “square as a pan pizza.” Doyle, who is married and has two adult daughters, readily admits his family is “the biggest priority” outside work. He also enjoys skiing and hiking, and he’s a “reasonably lousy golfer,” he says, logging about a dozen rounds a year. He loved tennis growing up, but a basketball accident ruined an elbow, limiting Doyle’s ability to enjoy either sport. Doyle hails from Midland, where his father was a market researcher for Dow Chemical for 30 years. After graduating with a degree in economics from the University of Michigan and earning an MBA at the University of Chicago, Doyle started his business career as a banker in the Windy City before running the European operation of a medical-equipment manufacturer. From there he was named vice president of sales and marketing at Gerber Products Co. in Fremont (north of Grand Rapids), before Switzerland-based Nestle S.A. acquired it in 2007. Doyle joined Domino’s in 1997 as senior vice president of marketing. By 1999, founder Tom Monaghan sought to broaden Doyle’s experience by appointing him executive vice president of international operations, where he served for five years. Over the next six years, Doyle rose through U.S. operations and became president in 2007. He kept climbing the corporate ladder because he kept learning. Throughout his tenure, Doyle has visited about 200 Domino’s stores worldwide a year, and while he isn’t known for giving stem-winding speeches or throwing around bromides, he does inspire loyalty in his charges, partly by keeping it real. His reputation as a straight-shooter came in handy when Doyle pulled the switch on one of the biggest decisions he’s made as CEO: completely overhauling the company’s food. One of the first things he did to pull Domino’s out of its post-recession malaise was to recognize that the economy wasn’t its biggest problem. Doyle saw that the food needed a complete makeover — and so, in his first year as CEO, he appeared in national TV ads admitting as much, in what has become a classic case study in the effectiveness of marketing transparency. Doyle vowed to viewers to “work days, nights, and weekends” to make the food better. From there, he dropped out of appearing in TV commercials and the company rolled up its collective sleeves and radically overhauled every element of its pizza, from the crust to its toppings. Since then, Domino’s has pretty much let its food speak for itself. Its biggest recent gambit, menu-wise, was to add fresh pan-style pizza, and that was back in 2012. Salads and brownies have followed as new menu staples. The most recent innovation is offering bread twists in Parmesan, garlic, or cinnamon flavors. Besides improving quality and adding menu items, another of Doyle’s major decisions was to stop chasing promotional blips with “topping of the month” campaigns that many in the food industry still emphasize. Doyle’s decisions also reflect his devotion to Domino’s franchisees. They’re crucial to the chain’s success — the company owns around 7 percent of its 5,500 U.S. outlets, and none of its nearly 9,000 international stores. While Domino’s handles product development, marketing, supply chain logistics, and the ordering platform, it’s up to local owners to invest in stores, and make and deliver the pizzas. Franchisees’ trust in Doyle goes back a long way. McIntyre says much of it stems from an appearance that Doyle made before the chain’s 40 largest U.S. franchisees in 2008, when he was still head of domestic operations and Domino’s situation was dire. 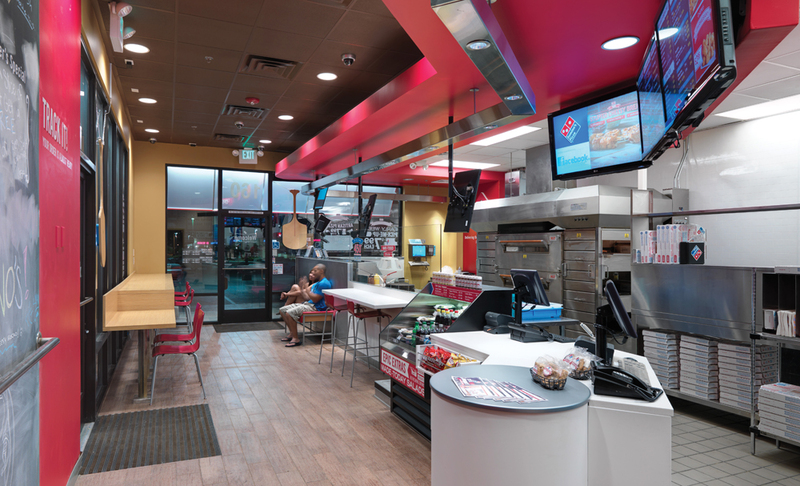 The latest design layout at Domino’s features fewer tables and chairs. Less people dine in the stores, but customers want to know they are welcome to sit down. Domino’s stores are still where all the magic happens, which is one reason Doyle frequently makes appearances at the company’s monthly Pizza Prep School, held in a replica pizza shop the company retrofitted in the middle of its headquarters. In fact, every new employee goes through a week of training so they understand the foundation of the menu, distribution channels, preparation, the digital offerings, backroom. operations, and marketing. Doyle concedes to the group that Domino’s also wants to make its stores more compelling externally and internally — not only for pick-up customers, but for the hundreds or thousands of pizza eaters who drive by an outlet each day. It’s the tricky flip side of the challenge faced by Pizza Hut, which made its living with dine-in outlets and now is trying to catch up with Domino’s in delivery. As long as it retains a system of retail locations, not just service depots, it’s a reality Domino’s must face at a time when fast-bake outfits such as Mod Pizza can assemble and serve a custom-made pizza in minutes. Patrick Doyle and Ford CEO Jim Hackett are both technology pioneers. The difference is that Doyle has made his company the acknowledged digital leader in its industry, while Hackett wants to put his outfit in that position. The two companies experimented in Ann Arbor last fall, using a self-driven Ford Fusion hybrid packed with researchers who wanted to see how the vehicle conducted itself — and how delivery customers interacted with it. Among their learnings: Customers want to say “hi” to the vehicle, even though it’s a machine. If this seems like a trivial pursuit for either company, think again. “If you look at the total number of miles being driven today by our system, we’re probably one-third to one-half the size of the total miles driven by Uber,” Doyle says. “Is there a way to do that more efficiently? Pizza Hut is already pulling up in the rear-view mirror. In January, it announced a partnership with Toyota to test its own self-driven delivery vehicles. Meanwhile, working with Domino’s could help Hackett achieve one of his primary responsibilities as Ford’s new CEO since spring 2017: leapfrog the competition in self-driving vehicles. His predecessor in the job, Mark Fields, was shown the door last year in large part because he allowed the company to fall behind in critical technology arenas.